To store those Clean & Dirty hankies! Perfect for picnics or parties! I recently found myself plum out of labels and desperate for more right away. I ran out to my local Joann Fabric and was so happy to find this printable fabric on a roll. I had seen similar types at Dharma Trading but couldn't wait. What's great about this particular brand is the ease of use and the fabric options which include poplin, twill, canvas, and silk. I couldn't decide between poplin and silk, but I finally settled on poplin because it's thin yet sturdy. 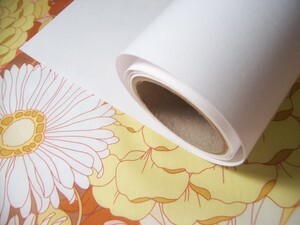 The roll (8.5"x120") cost me 25.00 and with a 40% off coupon it came to 15.00. You can also buy them in smaller sheet packs, but this is more economical considering I only had one coupon to spare. I designed the labels using a primitive yet super handy printing program called Label Factory Deluxe. (you certainly don't need this program to create your own labels) I cut three pieces off the roll measuring 8.5"x11" and gave it a try (after test printing on regular paper first). The result is not jet black, but I think the shade is just fine. I want to stress the importance of ink quality though. Please read my addendum at the very end of this post for the details. After letting it dry for 15 minutes you iron it and then peel the paper backing. Wash it for 30 seconds, blot on a towel and then iron it dry. 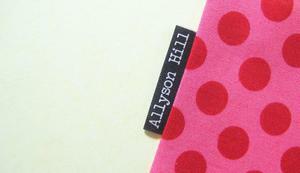 Cut into strips, iron over strips and then snip tags. Squirt some Fray Check onto a plate (not a paper plate because it will absorb, yeah I learned that the duh way) and dip the edges. Lay to dry on a paper towel or scrap fabric. The only tricky part I came across was with inserting the fabric into the printer. Since it came on a roll the edges would curl up making it hard to tell if I was positioning it correctly. To help, I took a piece of cardstock and inserted them together. Then I removed the cardstock before printing. Price: I broke down the price and here's how it worked out for me, but the results will vary for you depending on label size (I'm able to get 35 - 1.5"x1.5" labels per sheet), cost of ink (I pay 15.00 per cartridge), amount of ink used in your specific design (all black labels = a lot of ink), whether or not you have the 40% off coupon! 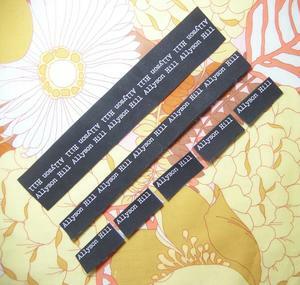 350 labels per roll (1.5"x1.5") @ .10 cents a piece = 35.00 (this estimate includes ink). Compared to "other" online label companies that's not bad at all (average prices I'm finding are 1,000 labels for 270-400 plus shipping). The labels I made are so basic, but just think about the possibilities! 1. 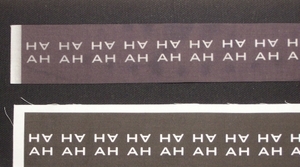 Can these labels be used for washable goods? 2. What kind of ink works best? Answer 1. The labels are not meant to be washed...they are really for non-washable items. I have NOT tested these labels in the wash so please do comment on your results if you have tried! Many are interested in knowing so do share. Answer 2. I recently bought some printer cartridge refills off eBay and have found that the ink works horribly with this printable fabric. The ink bled like crazy. I took a picture below to show you the difference. This picture was taken after rinsing under water for 30 seconds and ironing dry. You can see how the white sections on the top labels are now grey, but the bottom labels are still a crisp white. I used HP Vivera ink for the bottom labels and found little to no ink bleeding during the rinsing stage. So...I'm very sorry if others have learned this the hard way as well...you must use good quality ink for these labels. If anyone has input regarding different inks please do share (Epson?). Good idear! I used some of that printable fabric stuff and it works pretty well. I haven't seen the roll yet, maybe I should look harder! ohhhh! i'm so excited that you shared this info. such a clever lady. i'm going to check out joann's. which section did you find it in? i'm so thankful to have your blog as a resource. i'm going to make your coasters this weekend...try and help "bring crafty back" for me. ha! Great idea! I think I might give this a try. Great idea Allyson. They turned out really good! LOVE LOVE these!! I use them and they are fantastic. I'm also going to use them to make labels for some cloth bins I have. I'm going to sew them on. Your tags look GREAT! I don't think I've ever mentioned this before...but you have the perfect designer name. My name is just waaaaay too long. Hey Allyson thanks for the comment on my blog and the tags are a great idea.Nifty!! Those look great! I've been needing to get some like this. This is an excellent tip, one I'm sure I'll use. Thanks Allyson!!!!! I have some of the fabric sheets laying around from some projects - what a great idea! You are amazing for sharing this!! How exciting!!!! xoxoxox Love the suds pic! Great idea - and they look great too! Thanks for sharing. Oh these are great! I have my coupon in hand and can't wait to get to JoAnn's. Thanks for sharing your ideas with us. Do these work with laser printers or ink jet only? Thanks for sharing! Thanks for sharing! This info is great and you have an awesome blog! 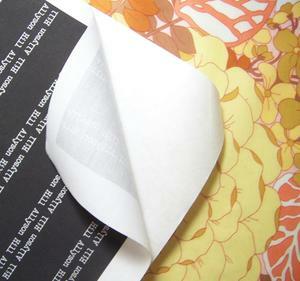 An easier product to use is "Printed Treasures" printable fabric sheets. They are already 8.5 X 11. 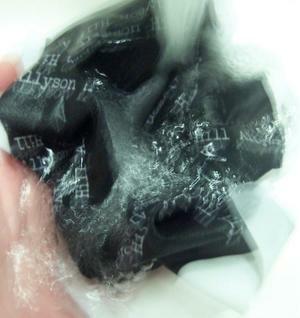 You print on them with your Inkjet, wait like 30 seconds and they are ready to use to sew. There's no washing involved. They cost about 3.50 a sheet and come in packs of 5. I got 65 of my labels out of one sheet which came to about .06 per label.